There is perhaps no better place to enjoy the holidays than the Lehigh Valley’s own “Christmas City”. A simple stroll downtown reveals a winter wonderland of elegant Christmas displays and beautiful holiday decorations, while the rhythmic sound of horse-drawn carriages and the quaint sight of the Christmas City Village create an enchanting atmosphere. Crossing the bridge over to Southside, where the brightly colored lights exude a cheerful Christmas glow, the hustle-and-bustle of Christkindlmarkt generates a joyful feeling of holiday excitement. Indeed, all of Bethlehem truly comes to life during the Christmas season. So if you’re looking for a way to make the holidays special, here is a short list of some of the many wonderful activities the city has to offer. Take an evening and enjoy a gourmet dinner or cocktails at one of the many upscale restaurants, including Corked Wine Bar and Steakhouse, where you’ll find a fresh menu of certified prime Black Angus steaks, chops, duck and seafood. You can also shop for handcrafted gifts in the boutique stores and one-of-a-kind Christmas markets; catch a live show at Southside’s critically acclaimed Touchstone Theatre; or sit back and watch one of the “Christmas Classic Matinee” films at SteelStack’s Frank Banko Alehouse Cinemas. But most of all, just spend some time delighting in the sights, sounds and atmosphere of a truly wonderful, and truly unique, Christmas City. 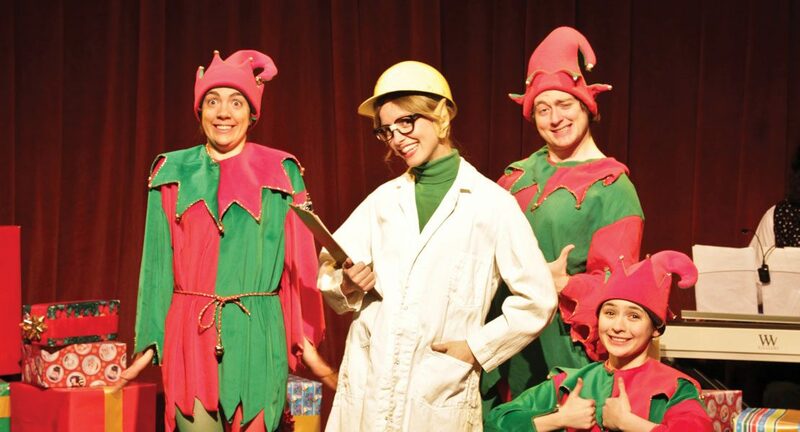 The Touchstone Theatre’s annual holiday variety show, the Christmas City Follies weaves together wonderfully entertaining characters in high-spirited sketch performances. Now in its 16th year, it has become a holiday tradition of “merry music, holiday hilarity, and seasonal sweetness”. Performances take place Thursdays through Saturdays at 8 p.m. and Sundays at 2 p.m. through December 20. Tickets cost $25 for adults and $15 for students and seniors. For more information, call 610.867.1689 or visit touchstone.org. A beautiful way to explore the history and traditions of Bethlehem, the bus tour leaves from Main Street and takes passengers on a picturesque journey through both the North and South sides, including a stop at the famous Star of Bethlehem atop South Mountain. Tours depart Thursdays through Sundays at 5pm and run through December 27. For more information, call 1.800.360.TOUR. A popular tourist destination, visitors are welcome to walk through the hotel and take a self-guided tour of its stunningly elaborate Christmas displays. Enter through the main lobby and delight at the sight of a handcrafted gingerbread replica of the hotel, twenty-six fully decorated Christmas trees, thirty-six holiday wreaths, six 7-foot-tall toy soldiers, two 6-foot-tall nutcrackers, a nativity scene and more than 35,000 Christmas lights. Each Sunday in December leading up to Christmas also features a visit by Santa Claus during the Musical Sunday Brunches, which are held between 10:30 a.m. and 1:30 p.m. Performed in the Rose Garden in West Bethlehem, the pageant is an emotional re-enactment of the events surrounding the birth of Christ. As fully costumed actors and live animals portray the action, a narrator and chorus of singers recount the story. The pageant is performed Saturday, December 12 and Sunday, December 13 at 1:45 p.m.
1 p.m. to 5 p.m. The Putz is closed on Christmas Eve and Christmas Day, and then reopens daily from 1 p.m. to 5 p.m. through December 31. Entrance is free, but donations are gratefully accepted. On the same level, and operating on the same hours, is the Star & Candle Shoppe, where you can purchase handcrafted Moravian items such as German stars, Christmas ornaments, jewelry, unique greeting cards, baked goods and more. A truly unique Bethlehem event, the 10th annual Live Advent Calendar takes place daily at the historic 1810 Goundie House. Crowds gather at 5:15 p.m., and at 5:30 p.m. one lucky visitor is chosen to open the door and reveal a special guest and Christmas treat. A wonderful way to view the downtown’s elegant holiday decorations, you can stop by the Visitor Center at 505 Main Street and pick up a map for a self-guided tour. This year’s theme is Victorian Christmas, so be sure to vote for your favorite. Located at 459 Main Street, the Bethlehem House Gallery showcases original art in a variety of contemporary styles. The Holiday Show features the work of Karel Mikolas, a renowned artist whose stone, steel, wood and glass works have been exhibited throughout the United States. Larger pieces, as well as smaller items that are ideal for holiday gifts, will be on display through January 9. The gallery is open Wednesdays and Thursdays from 11 a.m. to 7 p.m., Fridays and Saturdays from 12 p.m. to 9 p.m., and Sundays from 12 p.m. to 5 p.m. Items can be purchased in store or online at bethlehemhousegallery.com/shop/.